To promote the application and popularization in the e-commerce enterprises of our province, expand the exchange and cooperation between the industrial e-commerce companies and industrial enterprises, deepen the integrating development of manufacturing industry and Internet, accelerate the transformation and upgrading of manufacturing industry. On the morning of April 19th, sponsored by Shandong Economic and information Technology Committee and the People's Government of Jining City, jointly undertaken by Shandong International E-Commerce Association, Jining Economic and information Technology committee and The People's Government of Zoucheng City, the 2017 The Second China (Jining) Internet and Industry Conference was held grandly in Zoucheng International Exhibition Center. The Conference specifically invited Wang Jianwei, the director of Integration of Informatization and Industrialization(IOII) Promotion division, Informatization and Software Service Department of Ministry of Industry and Information Technology(MIIT) and Wang Peng, the vice president of China Center for Information Industry Development, to make the keynote speech. The elite including An Wenjian, the deputy inspector of Shan Dong Economic and information Technology Committee, Sun Zhiqiang, the deputy director of Information advancement Office in Shan Dong Economic and information Technology Committee, Li Jian, Shandong International E-Commerce Association Secretary General, Yu Dengjie, vice secretary of Shandong International E-Commerce Association, Zhang Shengming, vice mayor of Jining municipal government, Zhou Guangquan, the director of Jining Economic and Information Technology Committee, Wang Youbing, the inspector of Jining Economic and Information Technology Committee, and leadership of Zoucheng City, experts and scholars, business leaders, industry leaders gathered and attend this conference in Jining, Zoucheng. As the E-commerce demonstration enterprise of MIIT, Chairman unit of Jining Electronic Commerce Association, Jining top ten industry e-commerce demonstration enterprise, chairman unit of Jining E-Commerce Association, chairman unit of Jining Internet Association, China Transport Group attended this conference ceremoniously. Li Zhenbo, deputy executive general manager of China Transport Group presented the conference on behalf. At the meeting, the leadership of Shan Dong Economic and information Technology Committee, the leadership of Jining City and Zoucheng City respectively made the speech for the conference. The leades spoke highly of the outstanding achievements of China Transport Group in industrial e-commerce business and contribution of 1kuang.net in pushing cross-border e-commerce business forward and pointed out, China Transport Group as a benchmarking enterprise in e-commerce development in Jining and even Shandong province, should regard China Transport Group E-commerce Industrial Park as a key research base for the subject of e-commerce development in Jining and Shandong, also promote the advanced successful transformation experience of China Transport Group to the society. Then, the conference held the awarding ceremony for Jining top ten industry e-commerce demonstration enterprises, Jining top ten industry e-commerce service platforms, Jining top ten e-commerce service companies. Because of the outstanding achievements we have made in the industrial e-commerce, China Transport Group was elected as 2017 Jining top ten industry e-commerce demonstration enterprise and 2017 Jining top ten industry e-commerce service platform, and awarded honorary certificates and honorary plaque. The theme of this conference is "Industrial E-commerce--New Engine for the Transforming and Upgrading of Traditional Manufacturing Industry" Subsequently,Wang Jianwei, the director of Integration of Informatization and Industrialization(IOII) Promotion division, Informatization and Software Service Department of Ministry of Industry and Information Technology(MIIT) and Wang Peng, the vice president of China Center for Information Industry Development respectively delivered keynote speech. Director Wang pointed out, to deepen the integration of manufacturing and the Internet, accelerate the construction of powerful manufacturing country, the important embodiment of the deep integration is the application of industrial e-commerce in the field of traditional manufacturing industry. In recent years, Jining actively explore the new developing road, lead the transformation through heading the information industry, did a lot of work in the e-commerce industrial park construction, personnel training, enterprise identification and so on. 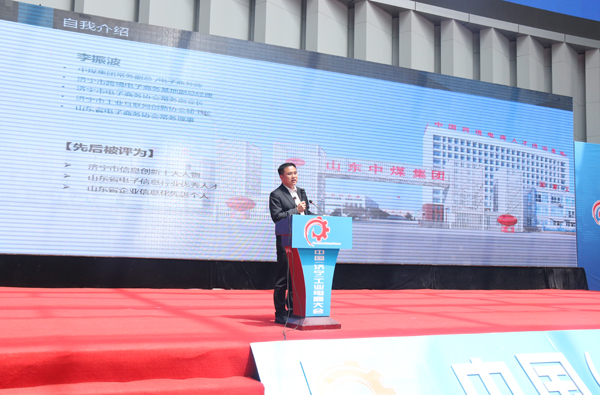 Now e-commerce has become the new strength and new bright spot for promoting the transformation of Jining, building ten0 billion income information industry "new Silicon Valley", made the city walking in the forefront line among the transformation, innovation ,development of industrial e-commerce enterprises in the whole country. President Wang emphasised the significance on personnel training in the e-commerce business transformation of industrial enterprises, he noted that China Transport Group "Jining industry and information commercial vocational training school" as the only training school approved by Jining Civil Affairs Bureau in Jining, shouldering the e-commerce personnel training task of southwest region of the whole province. Next we will coordinate arrangements e-commerce experts, scholars, and other well-known lecturers to give the lectures to cultivate more e-commerce elite for better pushing the transformation and upgrading of industrial enterprises forward in southwest region of Shandong. Subsequently, China Transport Group Deputy General Manager Li Zhenbo shared the successful experience of industrial e-commerce, cross-border e-commerce. General Manager Li said that with the rapid development of e-commerce, industrial enterprises boost business transformation by e-commerce has become a trend in the Internet era of industrial development. China Transport Group actively respond to national call, has made outstanding achievements in the industrial e-commerce, cross-border e-commerce, intelligent equipment manufacturing and other industries to obtain highly recognized of many national, provincial and municipal leaders, as benchmarking e-commerce enterprise in province, we would like to share the successful experience of China Transport Group industry e-commerce, lead the development with science and technology and innovation, provide more standardized, high-quality training platform for the provincial e-commerce personnel and industrial enterprises to make a positive contribution to the rapid development of the city and the country's industrial enterprises e-commerce!